You could use mine as a reference I only spent like 3 days working on it and I did pretty well during the presentation itself. Hello all! As the Topic Title says, I was wondering... Which Video Game is the most Intellectual? Is there a game which could "help" in studies? Or just a game that could improve our studies in some way? Or are all games just there for leisure/recreational purposes? NOTE: It could be on any console Looking forward to some of your opinions. Chem Question in a Recent Test Which I do not Understand? Is eating a waste of time? Well, I would think that because we spend hours everyday for eating, and things associated with it, where we could do more productive things. Instead of "resting" by eating you could read a book and at the same time gain some more knowledge. I think we would be more advanced, and as a species, we wouldn't have to rely on others, and we would be self-sufficient. Just my perspective though. Mmm, I can see why you think that. But then, why not just eat while you're reading a book? Or just eat while studying? You gain whatever protein or nutrients you need and gain some knowledge at the same time. Multi-Tasking is still an option that works I guess. However, not everyone can multi-task without getting distracted by one thing over another.Reading and eating is rather tricky, as you can easily mess you things up. I just dislike the idea of eating, I don't know why exactly. There is the aspect of wasting time on "unnecessary" things such as preparing the meal, so I prefer to eat simple and quick dishes. I actually calculated that I saved about 8 hours this week on eating already prepared food or left overs and I spent that time on reading and studying. The whole idea of going to a restaurant is really unappealing for me. You waste (in my opinion) a lot of time, and the social aspect of it isn't really that appealing for me either. I guess that being an introvert isn't really helping me here either. People say I'll have/ I have health problems, but my recent blood tests showed a great concentration of all important nutrients/chemicals/ whatever in my blood. I guess it can still backfire me later, but for now I still prefer to read a book rather than eat... I see. Not sure if I can relate to having to waste time in preparing meals to eat because I don't usually prepare the meals I eat. However, I can really relate to times when eating at a restaurant. I would usually have the thought of using the time of having to wait for the food to come for studies instead. But I don't usually eat out, so it doesn't really matter to me I guess. Well, I guess if you're health condition is still looking great you're ways of reducing time on eating would work. But then, everyone is different.. And in my opinion, I still don't really think eating is a waste of time. Hey guys (IB Survival), I recently had a IB year 11 chemistry test on the topic "atomic structure". One of the questions in the test completely baffled me and due to this I could not get full marks or a 7 out of 7 for my year 12 chemistry grades. The question was (may be worded wrong since I don't really remember): "How many periods in a proton?" Can anyone help?? Hello members of IB Survival. I have my IOP due this semester and was wondering how to begin the process of making it. I am very confused. I have a topic at the moment, which is: "How MLK Jr. arrived at his positions and what techniques he uses to communicate his ideas about justice and the opposition that he faces." This is based upon MLK Jr.'s speeches. Thank you guys; I am very confused right now. What is the most unhealthiest food of all time? There are many nutrients not found in plants that are very important for the body, or are only found in very small concentrations in plants. For example, foods richest in amino acids include meat and eggs. These foods are not unhealthy. Refined vegetable oils, such as canola oil and peanut oil, are definitely unhealthy as they clog arteries; studies have proved this. Trans fats are also unhealthy for the same reason. However, it is a common misconception of people to group all fat containing-foods into a single "unhealthy" group. Nuts contain fats (oils), and they are healthy. Avocados contain fats and they too are healthy. Only refined oils are unhealthy. Saturated fat - and even fat to an extent - has been victimized by health authorities and further, the media, for decades, but only recently has it been shown that saturated fat is harmless. If anything, the low-fat "movement" has made food unhealthier; companies replace fat with sugar in foods and label them as "low-fat! ", so everyone buys them. Don't even get me started on sugar. Added sugar is horrid for health. Fruits are okay even though they contain sugar, because fruit packs fiber, which slows the down the rate at which the sugar hits your bloodstream; but, added sugars are very, very bad. Lipid containing foods are specifically targeted because: Saturated fat consumption has been found to correlate with cardiovascular heart disease. Fats are more energy dense than carbohydrates, so it is easy to consume large quantities of kilojoules (calories) and gain weight. Humans like simplistic models and it is very easy for fatty foods to be connotative of weight gain.â€‹(Addressing each point:) Correlation does not equal causation. There are so many other factors at play. Also, there are a lot of exceptions. For example, there are peoples who consume high amounts of saturated fat via high consumption of coconut, and they are very healthy. The French eat a loooot of cheese and they are not unhealthy. Yes, eating too much fat can make you gain weight... so limit how much you eat! I come from an Italian family, and we always use extra virgin olive oil on almost everything we eat, but we don't drown our foods in the stuff! The third point is obvious. Come on, what is someone more likely to believe: that a greasy, bacon burger will make you fat, or that a piece of candy does? Fats are not bad. Artificially produced trans-fats and processed, refined vegetable oils are bad. But, other fats are not unhealthy. I speak very passionately about this, because my family has been using olive oil for a long time! On another note, butter is also not unhealthy. It contains many vitamins! Margarine is unhealthy though, because it is made from the same process that canola oil is produced by. Also, removing fats from food can have other effects. For example, studies have shown that calcium in low fat dairy products is not absorbed as easily as it is in full cream milk. Finally, fat slows down the rate at which sugars hit your bloodstream (like fiber does). Since people have been eating less fats, they have been increasing their consumption of refined carbohydrates, e.g. white bread. Refined carbohydrates are not that bad, they just seem bad because people don't eat them with fat. Adding butter or olive oil or peanut butter or X fat to refined carbohydrates like bread and pasta helps your body because the sugars making up the carbohydrates don't hit your bloodstream as quickly. But nowadays, someone is more likely to eat a big bowl of pasta with low-fat cheese. Whelp, that's a lot of carbohydrates in your body in a short period of time, with no fat to slow down the speed at which they enter your bloodstream. (It would also help if they ate whole grain pasta vs white pasta.) tl;dr Processed foods are bad. Whole foods are not bad. Eat fat, just not too much. Please ask me if you require any links to sources. I would like some links please. Well, I would think that because we spend hours everyday for eating, and things associated with it, where we could do more productive things. Instead of "resting" by eating you could read a book and at the same time gain some more knowledge. I think we would be more advanced, and as a species, we wouldn't have to rely on others, and we would be self-sufficient. Just my perspective though. Mmm, I can see why you think that. But then, why not just eat while you're reading a book? Or just eat while studying? You gain whatever protein or nutrients you need and gain some knowledge at the same time. Multi-Tasking is still an option that works I guess. However, not everyone can multi-task without getting distracted by one thing over another. Hello! I don't believe eating is a waste of time. Like, why would you think that? ahaha Eating is life. Live life to its fullest by eating all you can. 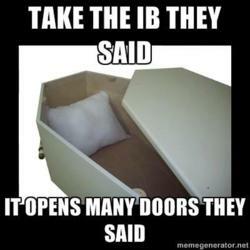 Good Luck with IB, My Friend. Hello! Creating a Video game sounds like it would work as a thing to get CAS Hours. It would definitely fit in with the Creativity Hours. (Not sure about Service and Action though) Good Luck with IB, My Friend. Should the Earth be more healthy? Hello! This topic really caught my attention, when reading some comments, it made me wonder.. What makes something or someone healthy? Is it being physically well? Spiritually healthy? Being able to just 'look' healthy? There are many questions to think about. In my opinion, I believe if the World was to be healthy, Earth should be shaped as a fruit. (Yes, a circle could represent an Orange or something, but then, I believe a spherical shape would be more related to Gumballs) Or.. If we all really wanted to, we could all start a revolution or something. Once again, Good Luck with IB and all the World Wonders, My Friend. NOTE: These are my opinions, not all of you readers may agree. My friend just spent 20 minutes eating a banana, is he OK? Hello! I don't believe you're friend has a problem. However, bringing up this topic is quite random. I did not expect something like this from you.